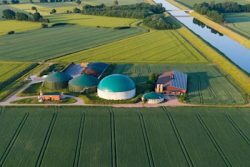 Cedigaz, an international not for profit association dedicated to natural gas information, has declared the biomethane sector is booming worldwide. There will soon be more than 1,000 biomethane production plants operating in thirty-four countries, up from 720 at year-end 2017. Long centered in Europe, the green gas sector is indisputably going global. Since 2010, world biomethane production has increased exponentially, reaching three billion cubic meters in 2017. In Europe, biomethane use is spreading across the continent. There are now nineteen European producing countries, whose output totalled nearly 2 bcm in 2017. The United States is now world leader for the use of biomethane as vehicle fuel, further to its production surge of 2014-2017 and driven by federal and state regulations. The fact that China and India have recently adopted biogas upgrading technology promises to be a game changer. Both countries have set ambitious biomethane production targets and figure as huge emerging markets. In Central and South America, Brazil is taking regulatory steps to exploit its huge potential. Despite a flurry of projects and rising interest among governments and industry players worldwide, data on this sector are comparatively scarce and sources of information – national, regional or sectoral – are highly dispersed. To fill this void, Cedigaz is launching a new report and database focused on global biomethane markets and production plants.